I have 7 serious questions about Comcorp as I preused its Accounts & Share Price. 3) WEAKENING CASH POSITION RAISE A RED FLAG! So it started with Rm39 millions (CASH) in Sept 2015 & ended in Sept 2016 with only Rm37 millions (CASH)? Where is THE REAL PROFIT? 4) MAMMERED BY CRASHING RINGGIT AGAINST RISING USD - PROFITS WIPED OFF? USD Debt of 70 Millions now ballooned by more than 20% due to depreciation of Ringgit from Rm3.15 to Rm4.15. So the last few quarter profits wiped off by currency loss? 5) SHARE PRICE PUMPED UP INTO GROSS OVERVALUATION! BUYERS BEWARE!! Share Price Jumped 200% from 30 cts to 90 cts. Is the Price Rise Due to Strong Fundamental or Pump & Dump? You must ask yourselves. Is Comcorp another Pump & Dump? The pattern eerily similar to IFCA. Now history. Remember the TV show Wile E. Coyote and Roadrunner? 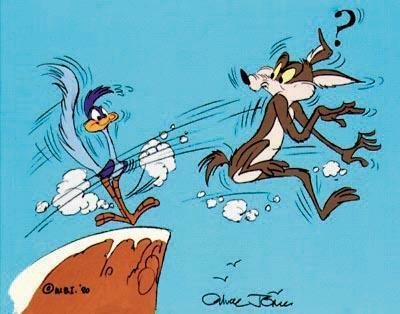 In it, Coyote devises endless ruses to catch Roadrunner. He sketches these obvious, graphic cartograms, complete with one-way arrows and an “X” to mark the spot. 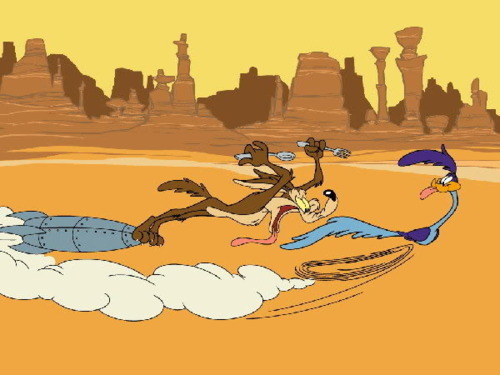 Inevitably, every scene ends with Coyote chasing Roadrunner through the desert, atop a mesa, and straight off a cliff. Roadrunner doesn’t care because he’s a bird. He can fly. Oh, poor Wiley Coyote, though, he runs and runs with bicycle-circling legs until he’s about ten feet from the cliff edge, suspended in mid-air. Only then does he look down to realize there’s nothing below him anymore. And that’s when he falls. He falls when the act of falling seems inevitable. But what if Coyote never looked down? What if he kept running? Oblivious to the ravine below him (and that he’s off belay) perhaps Coyote would just keep moving forward, with small puffs of white air and determination on his trail. If so good surely some one would have discovered it. Like Coldeye buying PBA, Dr Neoh buying Masteel & Yeoman buying Daiman.